StartBoat is designed to help yacht race officers conduct races and record finish times. StartBoat can help you with sign on by radio, with countdowns to flag sequences and most importantly, with recording finish times. 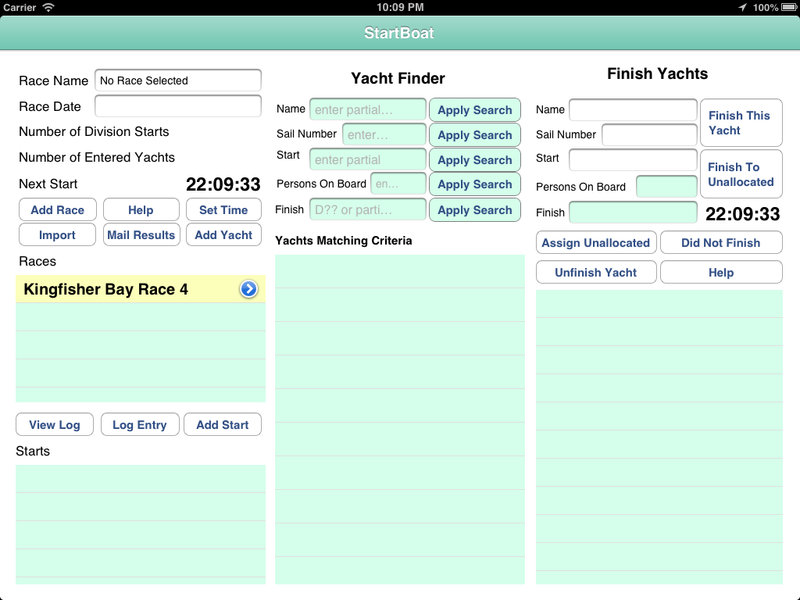 The app supports multiple races, with multiple start times for each race. There is a sophisticated search/filter engine to make it easy to identify approaching yachts. The app allows time to be synchronized to your “official time”. StartBoat can import entries from CSV files and export results so they can be uploaded into any results software you may be using. Files can be sent/received by email, or via iTunes when your iPad is connected to a computer. Finish times can then be imported into other software that calculates results, if required. The author has several years practical experience starting and finishing fleets of keelboats, trailerables and multihulls. On the water, StartBoat means that fewer crew are required, timekeeping is easy and results are available ashore within minutes of the last finisher. StartBoat is an iPad application, and is not currently available for iPhone.